In most rural communities all over Ghana it is rather uncommon for children to have a health insurance. As a matter of fact this puts parents into very difficult situations in case they want to take their children to see a doctor in times of sickness because they will have to pay for the hospital fees by themselves which either accounts big financial problems or is just simply not possible to afford for them. GLOVO thinks that this is a serious problem which we want to address on behalf of the children under our care. As a result of that we registered about 100 pupils at the GLOVO Academy at Oteeprow, a farming community near the Swedru Municipality, onto the National Health Insurance Scheme to help them access quality health care when the need arises on 30th March, 2012. Similarly we extended our services to the village of Asifaw in the Eastern Region on April 10, 2012 where 104 deprived school children were registered onto the National Health Insurance Scheme to enable them access good health care. As soon as the officials from the regional NHIS office arrived for the Asifaw programme, they started to perform the registration. Whilst of course all the school children were around, we were glad to see that through our efforts of bringing the NHIS officials to Asifaw, we grasped the attention of some rural dwellers from the surrounding villages like Nana Benyi, Lakpah, Krobo, Sikoko etc. and of course especially of the parents whose children we were registering. The Officials did not only register the 104 school children were registered but also some of the parents took a hold of the chance and also registered themselves. The second intention of our visit to Asifaw village was to discuss with the community Representatives about the way forward for Asifaw projects as well as to find out about the development of the tourist sites we have been telling you about. Therefore we all took a walk to the umbrella rock which we were told by the village people was now nicely cleared off from the all the undergrowth. Once we got there, those who had seen the place before were really quite amazed by the changes that had taken place. Now that all the branches of nearby trees are gone, you can truly see the size of the rock which is quite astonishing. So unlike the last time we came, on this day we could even climb to the top platform of the rock, where we had a fabulous view over the whole area. You could just imagine how wonderful it would be to spend some time up there, to have a picnic, whilst enjoying the view, the fresh air and the sounds of nature. In the end we are very grateful for the outcome of our visit to Asifaw. 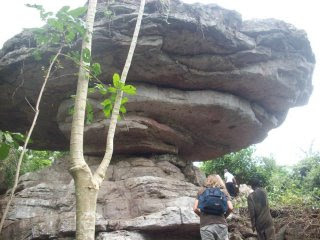 Firstly, of course the development of the umbrella rock is a huge step towards our aim of opening Asifaw doors for tourists and through that to raise funds for further projects. Secondly we are very happy that on one side we have been able to register so many children onto the National Health Insurance Scheme and on the other side, that through our actions we have drawn people’s attention and in a way sensitized them for the importance of their health care. Finally we cease this great opportunity to express our appreciation to Verena Kroemer and Hanes both volunteers from Germany who supported these projects. Please feel free to check out our homepage once in a while for news concerning our activities or to contact us for further information about the project should you decide to support. Let’s care and share! GLOVO WE REACH CHILDREN ! GLOVO WE RAISE LEADERS !! Hi blogger, Your fabulous website has a good-looking content and important information which give me new thing to explore in my project. I found what I actually demanded. Your website has a great content blogs. Knowing that you are not at a disadvantage because you are promoting a Insurance can provide you with the confidence to compete with the completely furnished home. Some property owners are even at ease with the idea of a home that does not have all the clutter they may be used to seeing during their home look for and traders love vacant home that they can close on quickly. Vacant homes are not a hurdle in your promoting journey and with a balanced view and a little upkeep your home can offer as quick as a completely decorated one. this is often as a result of each role encompasses a specialist to handle as compared to having one person play completely different roles throughout the assembly, for more information click here Florida Videographer. insurance News sub-limit. Even though the customers associated with detailed coverage associated with More effective Corners' Continent or perhaps International will get back again all of the cash as much as the absolute maximum coverage level of the particular plan. Insurance plays a vital role in our life. It secure our domestic life style. Insurance gives us a peaceful life style. I really pleased to observe this.Thanks.Carry on. I am always looking for the most affordable car insurance. I think that quotes are my go to way of finding a company to go through. This option comes with a hefty price tag, however, since self-employed people must pay the full premium cost of their health care insurance. No more printing and signing, fax, or snail mail. Just an easy online and over the phone enrollment. There are many different insurance plans to choose from and you want to find the one that best fits your individual needs without spending too much. Available individual health cover options have many options in today's health insurance plan market. You ought to make a list of what coverage's are important and which ones you think you ought to carry before buying an insurance plan. I think health insurance is important for children. Thanks for sharing the info and you can also visit our website Drive Shafts Melbourne for more details.